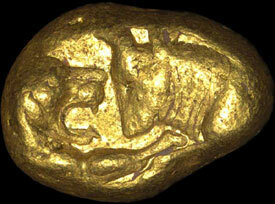 Gold coin from the Lydian Kingdom, circa 561-546 B.C. What is the material limit of wealth? What is the limit of the money, gold, silver, petroleum, diamonds, emeralds, jewelry, goods, and property that one can possess? The rich man’s wealth tires the poor man’s jaw. No sense in tiring yours truly’s poor hand by writing so many questions about wealth. Croesus is my idea of a rich man. He stands at the intersection of myth and history. In the Old Testament, he is mentioned as Korah. In the Quran, he is called Karun. He is the man who first coined money. Since the one who has money sets the rules, it is no wonder that the man who coins money is wealthy. Korah of the Old Testament, that is, Croesus, was commissioned by the pharaoh to suppress the Israelites. Korah was also an Israelite, yet he relied on his wealth and attempted to oppress his own people. Unsurprisingly, he faced the wrath of God and was buried beneath the earth with all his riches. Anatolia is a place where history is transformed into myth. Lydian King Croesus, alias Karun, as the man who coined money, believed that happiness lay in wealth and prayed to God that whatever he touched become gold. God granted that wish. He touched a stone and it became gold; he touched grass and it became gold. The king was very happy but then he felt hungry. As every piece of food he touched became gold, he could not find anything to eat. He prayed to God again and asked for a piece of food. But God did not answer and Croesus, the last king of Lydia, died of hunger. The moral of the story: Even the most fabulous wealth of the world cannot bring happiness. But try telling that to humankind. One historical fact in the legendary story of the Lydian king is that Croesus was sent to Persepolis as an “adviser” during the Persian occupation. Therefore, the wealth of Croesus must have been sent to Persia from Anatolia. In 1965, in the city of Usak, which had been between Lydia and Phrygia in ancient times, gold artifacts were found during illegal excavations in the Toptepe tombs. Three years later, smugglers found more artifacts in the tombs at Ikiztepe and Aktepe tumuli. Thus the story of Croesus was revived. The men who found those goods sold them to an antiquities smuggler for 65,000 Turkish lira. They were taken abroad after passing through many hands and reached the international market. New York’s Metropolitan Museum of Art bought the artifacts smuggled from Toptepe, Ikiztepe, and Aktepe for US$1.5 million [in 1966-67]. What a shame. It is an embarrassment for a museum to do business with artifact smugglers. The Americans were aware of this, because they immediately placed the artifacts in a warehouse to hide them. [Philippe de Montebello, former director of the museum, stated that the museum’s own records indicated that some staff members were aware when they acquired the items that “their provenance was controversial.” —WPR] After a while, in 1984, the museum began to display 55 works of art as “East Greek” artifacts. When the smuggling incident, first reported by a British journalist, was followed up by Turkish journalist Ozgen Acar, the Americans’ illegal acquisition of the items was uncovered, and a campaign was initiated for the repatriation of the Karun Treasure [also known as the Lydian Hoard]. Turkey sued the museum in 1987 to demand the return of the artifacts. It was understood that the Metropolitan Museum had a total of 363 pieces from the Karun Treasure. There were experts, reports, negotiations, and so on, and the proceedings continued until 1993. Finally, the Americans agreed to return the artifacts to Turkey to avoid a court judgment, and Turkey withdrew its case. The Karun Treasure was brought to Ankara in 1993, and then to the Usak Archaeology Museum, in the region where the artifacts originated, on Feb. 14, 1996. The smuggling and the return of the Karun Treasure merit that its exhibit be showcased to fill a whole museum. But the Usak Archaeology Museum is not equipped to display it, let alone to showcase the dimensions of its history. It is a small museum. Ancient stone artifacts are stacked on each other in the garden, because no storage place is left on the lower floor. Furthermore, all the historic carpets of Usak were placed in the museum by the local mufti when some carpets were stolen from the mosques of Usak. There is no room in the museum. During negotiations, the Americans made an offer. They said, “Leave 30 percent of the artifacts to us and we will build a museum for you.” This offer reflects a bitter reality. Although they are called the Karun Treasure, the artifacts are not related to the legendary king. They were discovered in the tombs of Lydian royalty, generals, and nobles. Yet, these artifacts have a beauty and splendor worthy of Croesus. The gold brooch in the shape of a seahorse is the only one of its kind in the world. So is the silver decanter with handles in the shape of the human figure. Gold bracelets from the 6th century B.C., glass bracelets, necklaces, pieces of jewelry, seal rings, incense containers, silverware, perfume bottles....Each piece is a wonderful work of art. There are also goldsmiths’ molds that were buried in the tombs to prevent reproduction of the artifacts. What we need is a museum worthy of the these world-famous works of art: the Usak Karun Treasure Museum. The Karun Treasure is not limited to the 363 pieces brought from the United States. In 1998, 10 additional artifacts unearthed during illegal excavations were found by the authorities. And two more were discovered during excavations directed by the museum. Currently, the treasure consists of 375 pieces. There are also eight gold pieces that appeared during an exhibition in a private gallery in Paris in 2000. No attempt has yet been made to reclaim them. Croesus was the richest man in the world. But it seems that those who are in charge of culture in Turkey are richer than Croesus, since they do not seek happiness in the historical wealth of our country!